The late 19th and early 20th centuries were periods of major change and important historical events throughout the United States, as well as key developments in photography technology. Life could be documented in a way that was never possible before, both physically and economically. Photography allowed for more precise archiving than either lithography or engraving. Roger Fenton and Philip Henry Delamotte were among the first photographers to demonstrate the immense potential photography carried for chronicling important events with their images of the Crimean War and the construction of the Crystal Palace in London for the Great Exhibition of 1851. Daguerreotypes were introduced in 1839 as the first complete practical photographic process, and remained the most common commercial process until the late 1850s, when the collodion process took over in popularity. This new process produced glass negatives which could be replicated multiple times, unlike the daguerreotype which resulted in a single, unique image. It was also relatively inexpensive compared to daguerreotypes, as the daguerreotype process required expensive polishing equipment and costly silver-plated copper for producing the images. Often printed on albumen paper, the collodion print took two forms, wet and dry, the former which necessitated a darkroom and was more popular with portrait photographers, the latter which required much longer exposure time and therefore was more often limited to landscape photography. 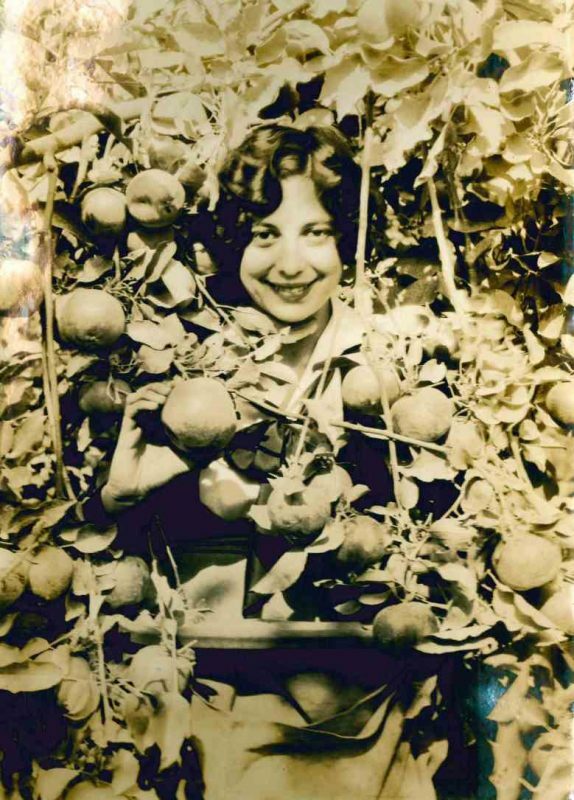 Ambrotypes and tintypes are examples of photographs produced via the collodion process. During the 1880s, gelatin dry plates largely replaced the collodion process. Utilizing glass plates with a dry emulsion of silver suspended in gelatin was more convenient and could also make more sensitive images. The first dry plate factory, the Eastman Film and Dry Plate Company, was established in 1879, a reflection of the popularity of the process. In 1884 Eastman developed dry gel on paper, or film, replacing the photographic plate and with it the necessity of carting around boxes of glass plates and chemicals. And in July 1888 Eastman’s first Kodak camera was put on the market, allowing anyone to take a photograph and let someone else do the processing. Photography went even more mass-market in 1901 with the introduction of the Kodak Brownie camera. F.A. Bernett currently has for sale several collections of interesting and important early American photography which correspond to and reflect these important changes and developments in the photographic process and the increasing commercial availability of photography equipment. 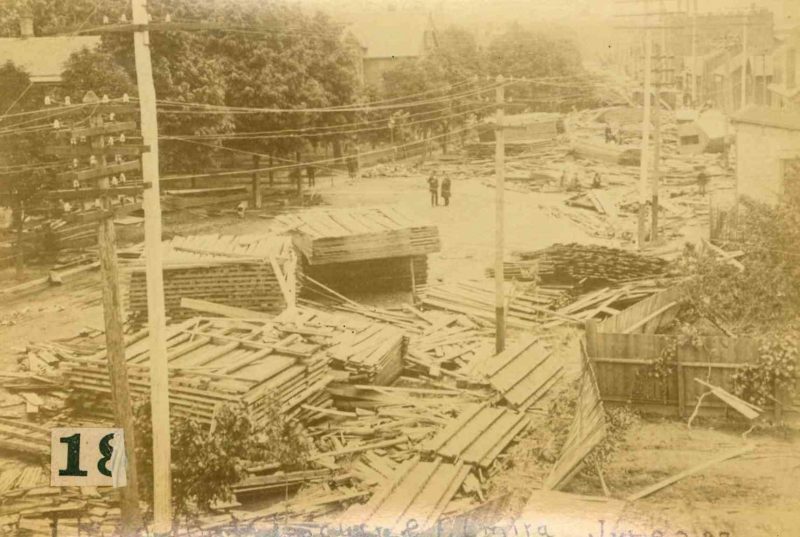 Collection of 19 Vintage Cabinet Card Views of the 1889 Johnstown Flood. Group of 19 cabinet cards by a local photographer, R.Y. 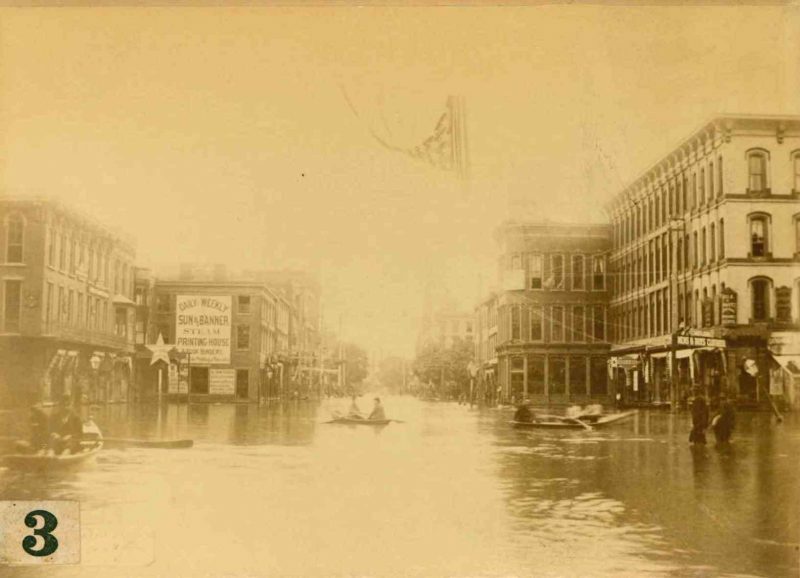 Nice of Williamsport, Pennsylvania, depicting the aftermath of the famous flood and subsequent damage in the town of Williamsport, including Nice’s studio and other local commercial buildings partially underwater, townspeople navigating the streets in rowboats, birds-eye views, and scenes of destruction and debris, some with captions incised into the negatives. Cabinet cards with mounted albumen prints measuring 4″ x 6 1/4″, numbered 2 through 20 in the lower left corners, some with Nice’s name printed on the mount. Williamsport, Pennsylvania 1889. Edwin Drake was hired by the Seneca Oil Company in 1858 to investigate suspected oil deposits in the Titusville region of Pennsylvania. 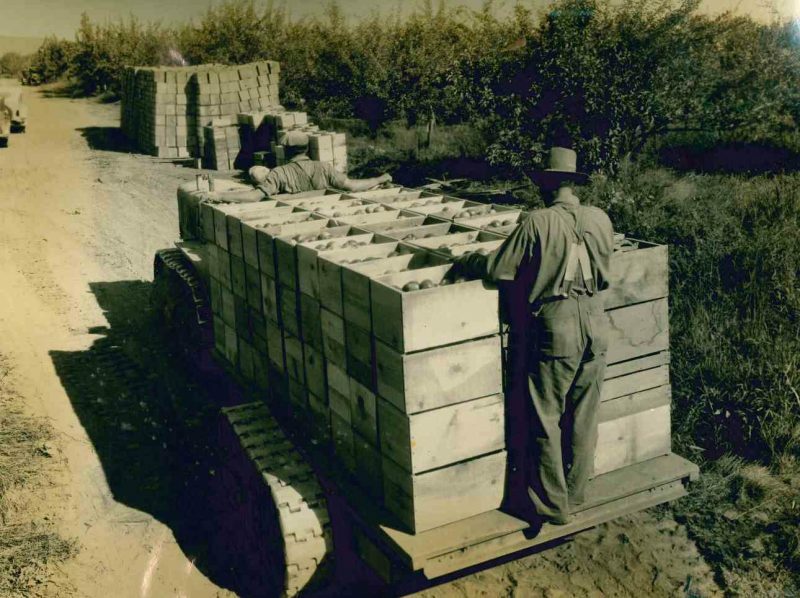 Prior to this, petroleum oil was known of, but there was not yet a market for it. Drake began drilling, with pipe and steam, but progress was slow and the Seneca Oil Company had pulled their backing. 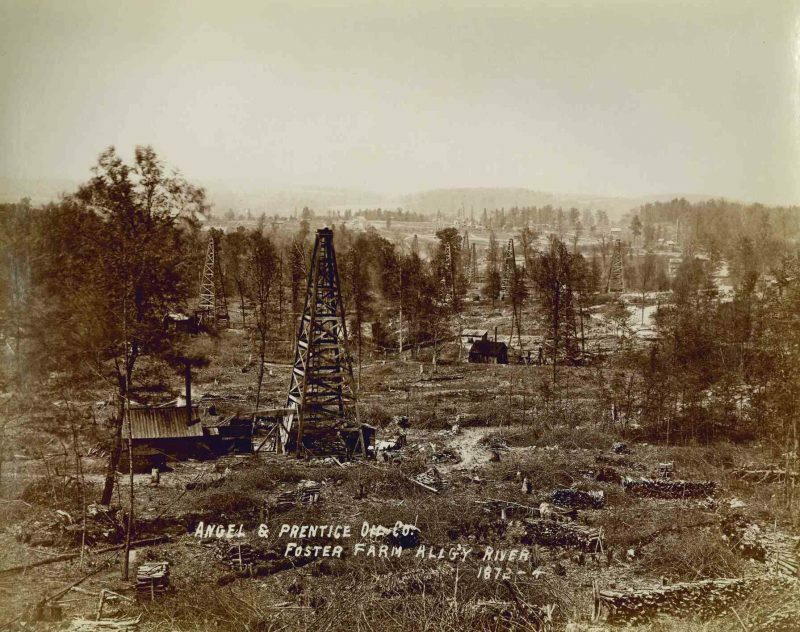 Using his own money and that of friends, Drake persevered and on the morning of August 28th, after months of drilling at the rate of approximately three feet per day, Drake’s driller looked into the hole and saw crude oil. 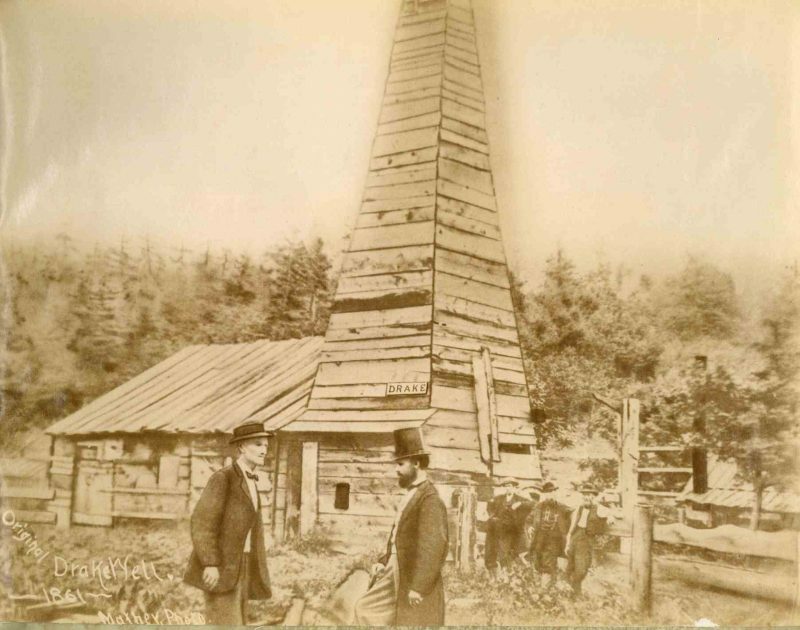 The Drake Well prompted the first big investments in the petroleum industry and additional drilling in the area that became known as Oil Creek, ushering in the Pennsylvania oil rush. 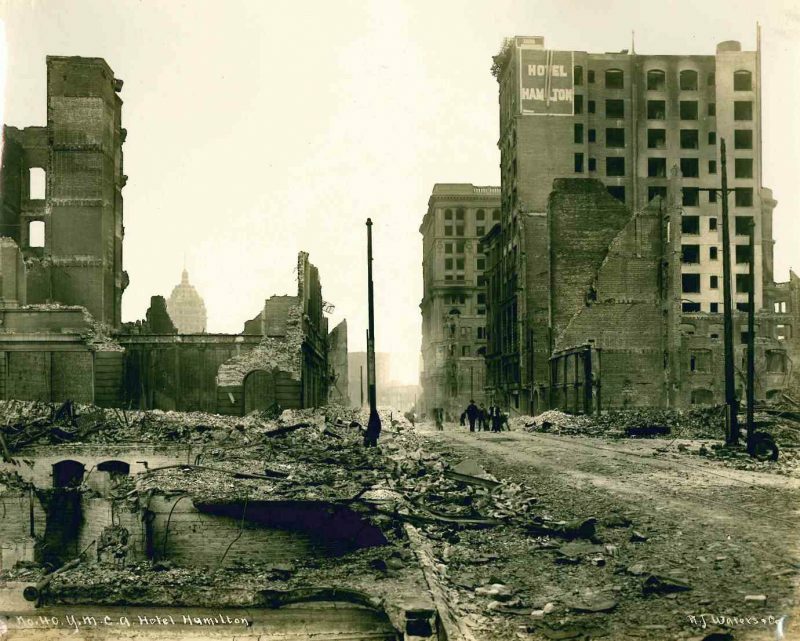 Photograph Album Documenting the Aftermath of the 1906 San Francisco Earthquake. 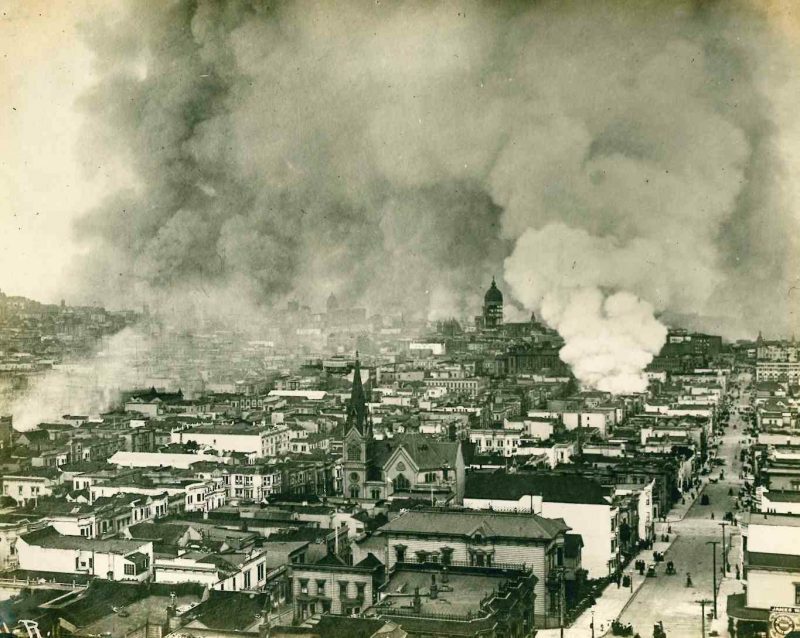 Collection of approximately 99 original black-and-white photographs showing the destruction caused by the earthquake and resulting fires, and the subsequent clean-up and reconstruction efforts, most pages with hand-written captions, with specific sites depicted including the Ferry Building, Market Street, burning buildings, refugee camps, City Hall, the Hearst Building, the Palace Hotel, gutted churches, rubble, and relocated shops, some photos with signature for R.J. Waters & Co. and caption within the plate, label affixed to inside front cover for Waters Company, San Francisco. Photos overall in very good condition. Various sizes to 8″ x 10″. Photos affixed to album leaves with photo corners and small dots of glue, many photos already loose, all pages detached from album. Oblong 4to. Cloth album. San Francisco (R.J. 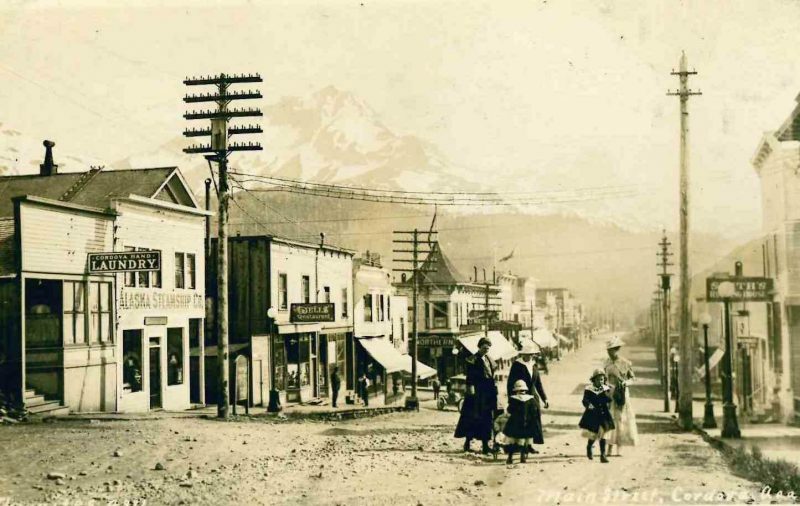 Waters & Co.) circa 1906. 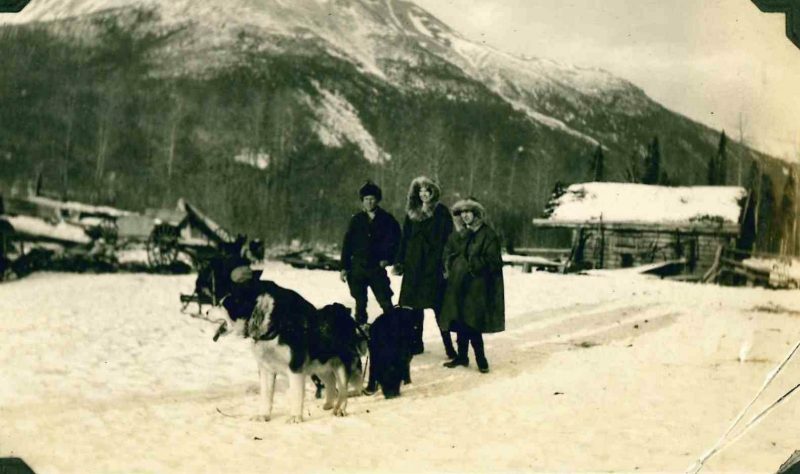 Collection of Original Photographs of Alaska. Album comprising approximately 500 original photographs of various formats, the majority taken in and around the copper mining town of Kennecott, Alaska, during its heyday in the 1920s, including the Bonanza, Jumbo, and Erie mines, nearby towns such as Cordova, McCarthy, and Ruby, hunting and skiing trips, dogsledding, Eskimos, railroads, the Childs, Columbia, and Kennicott glaciers, and steamships, with 21 most likely unpublished photographs captioned “Mt Logan Alaska 1925 – June / Guided by Andy Taylor, Famous Alaskan Guide” being of particular interest, depicting the first successful expedition to the summit of Mt. Logan in the Yukon Territory, Canada’s highest peak, with photographs showing the team setting up camp, loading their sleds, and trekking, together with several pieces of ephemera including a telegram, a Pacific Line steamship catalog, and a newspaper clipping. Original album disbound and trimmed to fit, with original album pages and hand-written captions intact, some original photo corners replaced. Small folio. Housed in two contemporary albums. N.p. (Kennecott, Alaska), circa 1920s. A geologist first approached the Alpine Club of Canada in 1922 with the idea of sending a team to summit Mt. Logan. A team of Canadian, British, and American climbers was assembled, and their trip was delayed from 1924 to 1925 due to delays in funding and preparation. They began their trip in early May, journeying from the Pacific coast by train, and then traversed the remaining 120 miles on foot to the Logan Glacier, where they established base camp. On June 23, 1925, the team of Albert H. MacCarthy, H.F. Lambart, Allen Carpé, W.W. Foster, Norman H. Read, and Andy Taylor became the first people to stand atop the summit of Mt. Logan. A Picture Journey to Farms in Idaho, Washington, Oregon. Spokane, Washington.- Pacific Northwest Farm Trio. 62 pp. promotional photo album containing 72 mounted silver gelatin photographs of farms, orchards, crops, and related agricultural activities from farms throughout the Pacific Northwest, each page with a typed descriptive caption below the photo, some of the photographs signed within the negative, known photographers include Asahel Curtis, Bradbury Williams, and Arthur Prentiss. One of the photographs coming loose, several pages with small tears to margins, some minor warping and toning of pages. Oblong 8vo. Leather. Some bowing to covers, rubbing and small losses along extremities, small splits at spine. Spokane, Washington (Pacific Northwest Farm Trio General Offices) n.d. (circa 1930).